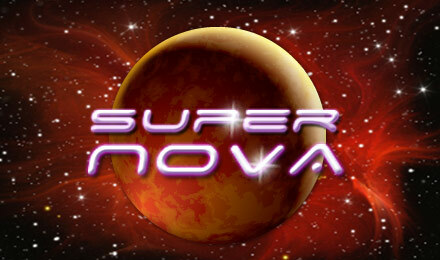 Super Nova Slots|Spin to win at Moon Games now! The cosmic Super Nova Slots has 5 reels of asteroids, moons and stars plus 3 out-of-this-world bonus games for multiplied wins! Super Nova Slots is a 5 reel 25 payline slot machine with a space adventure theme and some additional bonus features which make it an attractive gaming option. It features the innovative Exploding Reels feature rather than your regular slot bonuses. Super Nova Slots has a range of regular symbols from the Zodiac calendar so ranges from Leo to Scorpio and all the other star sign symbols. It also uses the standard Ace, King and Queen. This game doesn’t feature a Wild or Scatter but it does have the Exploding Reels special. The pay table has a range of symbol combinations which trigger the Reel Explosion and when this happens there’s the chance to pick up extra coins. The best thing about this feature is it continues on and on until no winning symbol combos are present so it can keep going for many spins. This slot machine is a little different from others on the market which makes it an interesting slots gaming option.